Plants can grow almost everywhere. This book explores ecosystems particular to the seven continents and watery environments, including forests, deserts, mountains, the ocean, and lakes. This book also includes an examination of how artificial environments like greenhouses and the indoors can be healthy for some plants, and how some artificial environments cause harm even beyond their own boundaries. 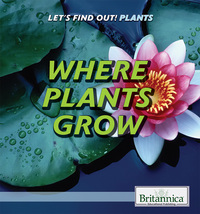 For each environment type, this volume describes the types of plants that live there, and how well they thrive. Any young reader who wants to explore the needs of plants and how their environment meets those needs will find this book essential.